X have some options for better work, most time X just use the universality options for run on most computer. But you can tweak them. With the best result, you will get the double performance. My system is Gentoo 2006.1 with X.org Server 1.1.1-r3 and xf86-video-ati 6.6.3 with DRI(Direct Render Interface), also I have the beryl 0.1.4 and AIXGL for the 3D desktop test. Hardware is Powerbook pre-High definition, G4 1.67 and ATI 9700 with 128M. Let's see the default Display adapter configuration. 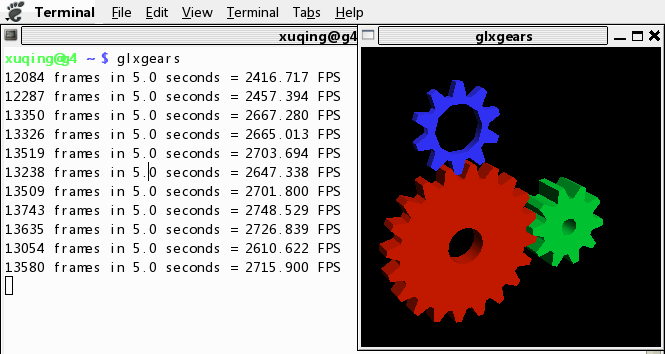 BoardName "RV350 [Mobility Radeon 9600 M10]"
The frames per seconds benchmark with glxgear looks like below. Add some options in this device section for tweak. Let's bechmark and see it again. How about these options works in the full hardware acceleration berly ? Oh, it back to half and unstable. But I think it's the free ati driver's problem. I feel Intel's GMA series open source driver is much better and stable than it, I will also test it if I have time. OK, What's these options and value means ? AGPMode define the bandwidth of the AGP bus, the 4 means 4 times than the default AGP bus bandwidth, the defualt AGP running on 66Mhz with 266MB/s bandwidth, and Xorg will auto decide in 1X in default, you can tweak this option for more bandwith, the highest value of this option is 8 but it's need you conform your hardware support it. Most display adapter support and universal driver mode called framebuffer. It create a spool in memery and map it to the screen pixel, it's a FB device. Xorg write data into this spool, and the the driver read from this spool and write the data to the screen. it's not fully optimized. ATI driver support a DMA(Direct Memery Access) mode, Xorg can write the data into the memory of the display adapter, it means Xorg can write to screen skip the memory spool of the FB device. Fast write option looks like FBDev, I't also a memery access mode of display adapter. It's skip memory access and write data to display adapter directly. Enable Page Flip will increases performance, it tweak the memory access mode. This option will be disabled if EAX architecture is in used. DynamicClock is "Intel SpeedStep" technology for display chips. it adjust the performance of display adapter only for save energy. 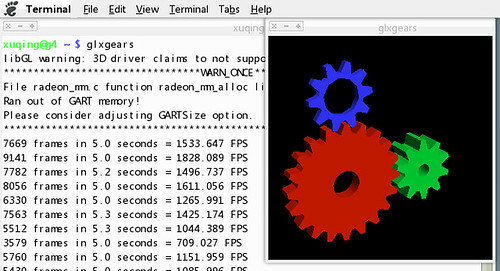 RenderAccel looks like it name, enable it for Render Acceleration Mode. This option is default enabled. Other options will increases performance more, I will do more around it and blog it more.